Xemnas pouted, his shoulders slumping due to his lack of Saix. He frowned, walking over to Aerith and pointing a thumb at Sephiroth, "Am I supposed to get him to leave?...Or can I turn him into a nobody?" Sephiroth stood on top of one of the tables, "MWAHAHAHAHAHA DIE CAKE DIE!!!" He jumped up in the air, did a flip and stabbed through the cake and the table, "Oh....I'm stuck." Aerith slapped her forehead. "Sephiroth, I didn't need your help cutting the cake. I did just fine with a normal knife." She glanced at Xemnas. "If you think you can, go for it. I won't say know. ...Just make sure he pays for the damages. Otherwise, I'll have to sick a friend of mine on him." Xemnas calmly climbed on top of the table and ushered Sephiroth down by posturing himself amd using a bit of magic, he loosened the blade. He carried it outside and then proceeded to chuck it with an Aero spell as far as Xemnasly possible. Sephiroth let out a girlish scream, "MASAMUNE!!! NOOOOOOO!" 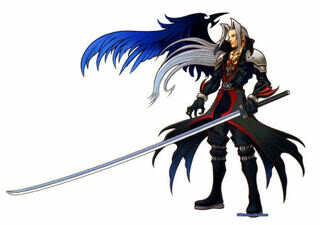 He dove out, not noticing Xemnas pocketing his change purse, after his blade. The sound of a wing flapping was heard and all went silent as black feathers fell from the sky lightly. "So, you're very beautiful compared to any normal human girl," He said smiling, "So I suppose your not, righ?" "Hector," He said slightly frowning, "It's not actually the politeist thing to do, identifying before even knowing one well, and then saying this. I apologize for my friends lout like actions." Aerith nodded approvingly to Xemnas and then turned her focus back to the conversation. "Well, I'm sort of not human, technically," she admitted. "But that doesn't really matter, now does it?" She smiled sweetly, hoping that would banish all thoughts of the subject. "Nah, I was just saying so because where we come from, it's common for a decent amount of non-humnas around, it doesn't bother me, I just figured I'd ask, to see if I was right," He said, eating more of the cake, even though there was a hole in it, "Man, this stuff is addicting, I'm going to get real fat quick." "We've had so many issues with barocs not accepting this numerous times however," He thought out loud, "It gives me a headache.."
"Really? That's terrible," Aerith said with a sigh. "People need better things to do than to cause non humans trouble." She sliced another piece of cake and set it before Hector. "Eat as much as you like. It's nice to see people enjoy my cooking." "Yes! I'm going to be so overstuffed with goodness that I won't be able to wield my axe!" He said in a cheery tone, eating more. He however, almost never gained weight. No matter how much he stuffed himself. "That was very tasty, and you have my thanks. I would love to eat more, but I'm currently on a diet. Soon I'm going to go on a exploration, and I need to be healthy so I can travel further it in a day." 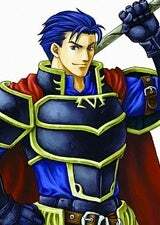 Eliwood was never a hearty one, if he traveled for too long he would collaspe, so he wanted to be in shape so that chance decreases. The Organization's ninth member watched as the strange and mildly disturbing scene played out and the Sephy-guy flew off leaving a trail of his ummmm...featheres all the way outside. 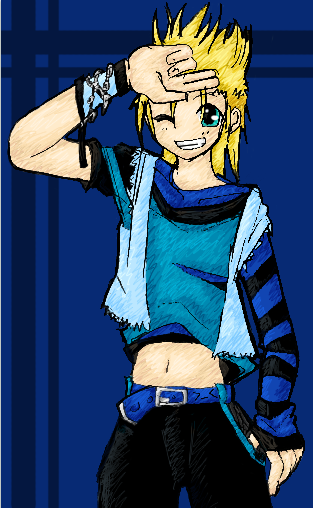 Demyx walked back to the back for what seemed like the umpteenth time that day and returned with the broom and dustpan. The blond swept up all the strange feathers and emptied them into the waste basket in the part of the cafe that was for EMPLOYEES ONLY if the sign was anything to go by. Once that was done the nocturne turned waiter poured himself a cool glass of water, waiting for any new customers to serve or messes to clean. Aerith giggled at Hector's words. "Surely someone as strong as you can weild an ax, even after eating a hundred cakes." She then stood. "Could I interest you in anything to drink? Some tea, perhaps?" "Let's go!" He said, dragging him out of the shop. 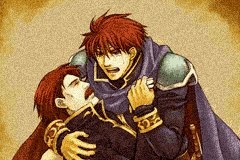 Eliwood before being completely dragged out, gratefully thanked her for her service. "Thank you for coming," she called after them before breathing a sigh and going back to the counter. They were without customers. Hopefully, this wouldn't continue. "Hi! I'm My Melo," She said with a cute smile, "You have a lot of dreams! I got your note in my Melody box! I'm glad your dream wasn't taken yet!" She said smiling adorably. Aerith stared at the small creature before her and tilted her head. "Huh?" She knelt down to get a better look at the plushie creature. "My note?" she repeated. "I don't believe I sent you anything. Are you sure you have the right person?" "My name is My Melody. But Everyone calls me My Melo." Aerith still wasn't quite sure what the plush toy was talking about, but it made as much sense as anything else she'd seen today. "It's nice to meet you, My Melo," she said with a smile. "Since you came all this way, would you like a piece of cake?" The plush creature was just too cute for words. It would be like having a teaparty. "You like sweets too! They're a lot of sweet scents in here." She said, she looked over at a table, they were huge for her. So she pulled out her umbrella and floated up to one, until she landed on top of one. Xemnas stared at the living stuffed animal in wonder, he leaned down, hovering over it, "Are you a nobody?..OR a heartless?" "Why do you not have a dream?" 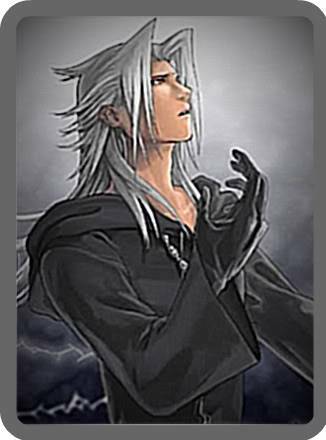 Xemnas frowned, pondering the question, "Well, that is perhaps due to myself and others being nobodies. Nobodies are just the remnants of a human, the shell if you would; the body left behind after the heart was extracted. We are no longer human, we no longer feel emotions, thus we no longer dream, for there is nothing to dream of other than regaining our hearts and our humanity." "I like you. Because you have a dream now." Aerith slapped her forehead at Xemnas's speech. Why oh why did she hire a nut, again? Oh right, because no one but he and Demyx had applied. Well, until they got more customers, there was no need for more servers. She smiled at My Melo. "Do you think my dream will come true soon?" she asked, cutting a slice of cake for the little creature and setting it before her. Xemnas looked at the little creature with puzzlement, "I suppose that's acceptable, don't expect me to return the affection, because I can't." He did not notice Aerith's previous facepalm, or maybe he was so used to that reaction he ignored it, who knows? "It tastes good, I know it will come true, lettme help you," She said pulling out what looking like a pink wand. She waved it a few times before swirling it around in the air, "Meeelllooooddyyyyyy Mark!" She said, and a sticker with a heart on it landed on a wagon full of fliers. The wagon came to life and stared at My Melody for a moment, wondering what to do. "A-fec-tion? My Melo doesn't know what that means." "Oh, thank you My Melo!" Aerith said, too happy to be stunned by the wagon coming to life. The only thing that worried her was that the animated wagon might frighten some people away.